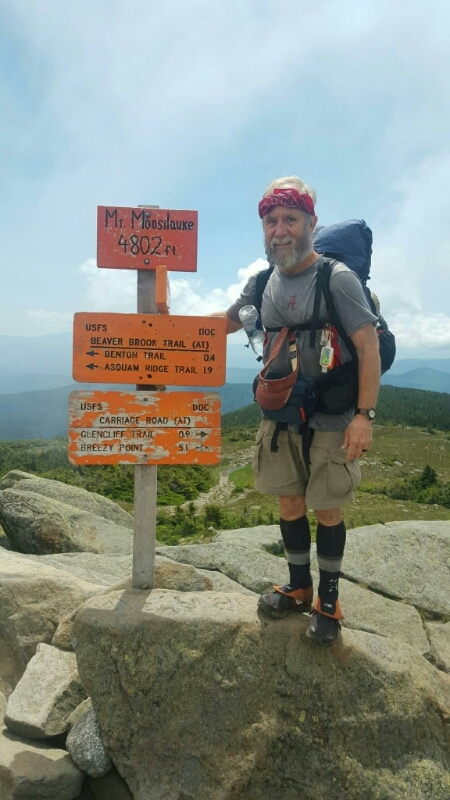 Bamadog, 61-year-old Marty Dockins, who retired in March 2017, has been hiking strong recently and on July 1, he arrived at Franconia Notch, about 70 miles into the state of New Hampshire. During the last few days of June, Bamadog had climbed some significant mountains including Smarts Mountain (3237 ft), Mt. Cube ((2911 ft), Mt. 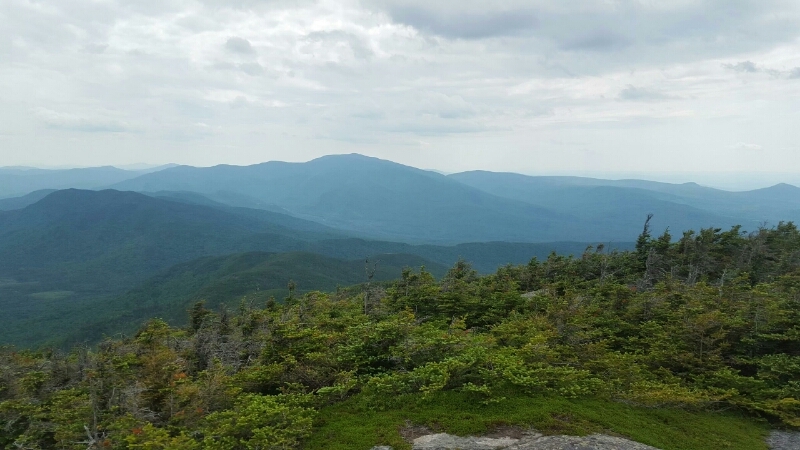 Moosilauke (4802 ft), South Kinsman Mountain (4358 ft), and North Kinsman Mountain (4293 ft). He was poised to enter the White Mountain National Forest and the Appalachian Mountain Club Hut system. Franconia Notch is about 1820 miles into the 2190-mile thru-hike. 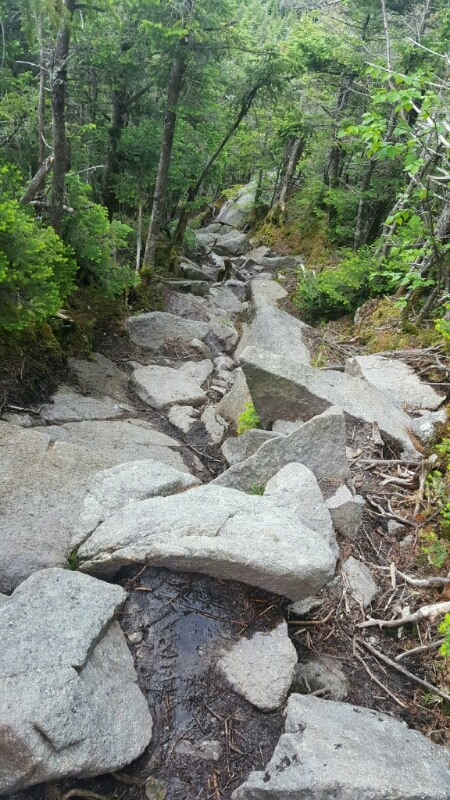 Bamadog had a difficult hike on June 29th as he climbed over Mt Moosilauke. He fell twice descending the dangerous north face of the mountain. 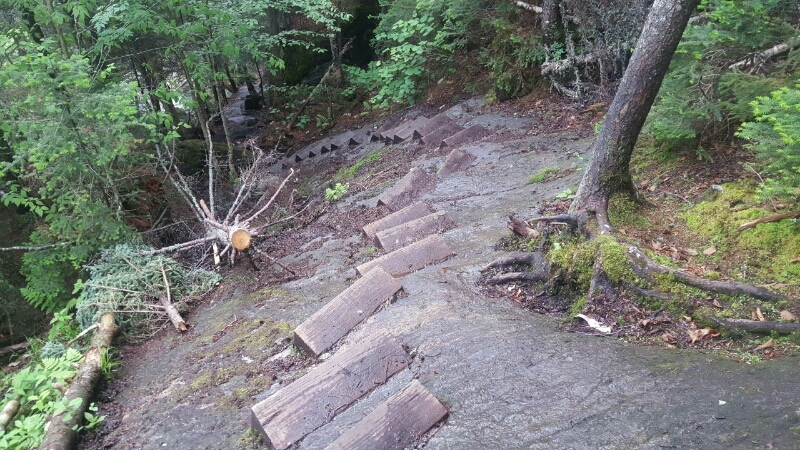 The steep descent drops 2,930 feet of extremely technical hiking over 3.8 miles of trail. Today is a bittersweet day but a good day. Psalm 118:24. (This is the day which the LORD hath made; we will rejoice and be glad in it. – my quote). As I hiked, the Lord was speaking to my heart letting me know my wife needs me a lot more than the trail does. I did a very tough section over the Kinsman’s today. 17 tough miles. Both of my knees are hurting letting me know I don’t need to be where I am alone scaling wet rock walls and cliffs and bouldering from daylight until dark. It is time to go home to my sweetheart. I called her and she is almost halfway here already. Only one speeding ticket so far that I know of. Pray for traveling grace for her please and for us as we make our way home. It has been an amazing journey. I want to thank everyone that has had a part in this. Trail angels and maintainers. Total strangers doing wonderful things for me. The list goes on and on. I want to thank my Lord and Savior Most of all. His Holy Spirit has been with me every step of the way. He promised in His Word that He will never leave me or forsake me. You can count on that if you are a child of the King. 1818.5 miles. Not bad for this ole guy. Only God knows if I will come back and get the rest of it done. That is His call. I have peace about it either way. I needed to prove to myself that I could do this. I have done that with God’s favor on me. None of it would be possible without Him. I could not have done this without my wife. She has been my help and strength and encourager through this along with my two sons. Thank you so much to all of the people who have signed my guest book and have been such an encouragement. It meant so much to me. It I can help any of you down the road let me know. Goodnight sweetheart. Headed home!!! To God be the glory…Bamadog. I am so sad to see Bamadog leave the trail. He started his adventure on February 15 and walked for 4 ½ months. I know he must follow his heart and mind and body, but he was doing so well. Reading his journal on a regular basis, I could tell that God was teaching him many things over the miles on the AT. The last 370 miles of the trail through New Hampshire and Maine are brutal and will challenge the hiker every day to Katahdin. I am sure that the trail has changed Bamadog and that God will use his experiences to share His faithfulness with many friends, family, and acquaintances for years to come.